Authentic Geek! : The "Blue Beetle" TV Series Demo Trailer or "The Suit Makes The Man!" The "Blue Beetle" TV Series Demo Trailer or "The Suit Makes The Man!" Seeing as how 'Smallville' will be ending it's long run after this next season, it should come as no surprise that The CW execs are looking for a new comic book-centric TV series to keep their ratings up. One of the proposed comic book adaptations is the Geoff Johns penned 'Beetle' series, which featured Jaime (pronounced 'hi-may') Reyes as the third man to call himself the Blue Beetle. The trailer, done as a 'proof-of-concept' piece like the 'Mortal Kombat - REBIRTH' short, was made under very strict conditions and was directed by Alex Winter, who also directed the two live-action 'Ben 10' films, "Ben 10 - Race Against Time" and "Ben 10 - Alien Swarm". 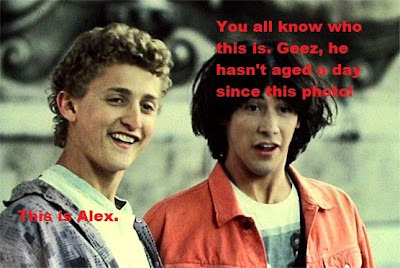 If the name sounds familiar, it's because he also played "Bill S. Preston, Esquire" in the 'Bill & Ted' movies! Judging by the trailer, I'd say the chances of this series actually happening would be ..... EXCELLENT! Time for an air-guitar solo!